This safari will take you through Serengeti National Park, the endless plains holding a dense population of wildlife and birdlife. Then, you'll continue to Ngorongoro Crater, the fabulous territory for Big Five animals. This is the best option to explore both Serengeti National Park and Ngorongoro Crater. Relax on your seat and enjoy the magnificent wildlife and sceneries of Tanzania with Rhino Explorer Tours & Safaris! Maximum group size: 1-4 persons (group safari) or 5-6 persons (private safari) in a pop-up roof 4X4 vehicle. Rates will vary depending on the type of safari. English speaking guide. German, Spanish, French guides available upon request. Main animals to be viewed: Lions, lioness, giraffe, impala, Thomson’s gazelles, cheetah, zebra, wildebeest, hippopotamus, leopard, and elephants. During this five days' safari, you will be accommodated for four nights in various accommodations, including one night at Venice Hotel, one night at Seronera Campsite, one night at Simba Campsite, and one night at Arusha Center Inn Tourist. The public campsites which are collectively called Seronera Campsite are located in the Central Serengeti area known as the Seronera. Seronera Campsite is one of the most famed campsites in Tanzania for animal encounters. This campsite is neither guarded nor fenced, animals will pass through the campsite at night on their nocturnal wanderings. Fire camps will make sure to chase predators. Your experience in this campsite will be authentic and close to nature. You will have sleeping mats in the tents and access to the outside bathroom and shower. Simba Campsite lies on the very rim of Ngorongoro Crater and has an excellent view across the caldera. A fantastic sunrise over the crater rim opposite makes a fine breakfast scene. Often there are elephants wandering around the camp. This camp is guarded. You will have sleeping mats and en-suite bathroom in the tents and access to hot showers outside of your tent. You’ll arrive in Arusha and have an overnight at Venice Hotel in your already-booked fresh room. Arusha is a safari city which is located under Mount Meru in the northern part of Tanzania. Arusha is inhabited by Meru, Maasai, Waarusha, and Barabaig people. Early in the morning around 06:00, you will be picked up from your hotel in Arusha and depart with en-route game watching to Serengeti via Nabi Hill Gate where your driver-guide make confirmation of fees while you enjoy your lunch box. You’ll arrive in Serengeti in the afternoon time where you’ll enjoy your afternoon game drive in the heart of Serengeti National Park. 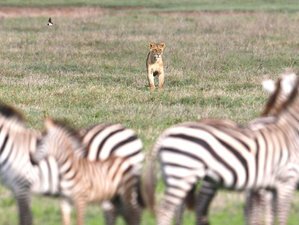 You will able to see lions, lioness, giraffe, impala, Thomson’s gazelles, cheetah, zebra, and wildebeest in plenty. At sunset, approach your already-prepared Seronera Campsite for a shower, hot dinner, and overnight. Serengeti is fantastic especially in the morning time when predators coming back from hunts. Do you know how animals behave in the morning? If you are lucky, today, you’ll witness hippopotamus returning into the water after whole night striving for food, leopard hanging a Thomson’s gazelle prey up to the tree, cheetahs chasing troops of impala on target for food, elephants massaging their body on the tree, and more. When in season, witness the part of wildebeest migration and bird life. After lunch, you’ll depart with en-route game drive in the endless plains dotted with rocky hills and the home of predators with your open roof Land Cruiser with your camera at hand. You’ll arrive in Ngorongoro Crater at sunset for hot shower, dinner, and overnight at Simba Campsite. After breakfast, you’ll drive to Ngorongoro Crater and descend to the crater floor for a game drive. In the afternoon, you’ll ascend to the rim and depart for Arusha. Ngorongoro Crater is an oasis for wildlife habitation. In Ngorongoro, you’ll see the volcanic caldera which is the world's largest, full of grassland, forest and swamp, a setting of jaw-dropping beauty. The permanent water of the crater floor supports a resident population of more than 24,900 large mammals including elephants, lions, leopards, hyenas, jackals, wallowing hippos, waterbucks, baboons, and even the rare black rhinos. Sharing this empathetic spaces with the wildlife are the Maasai people, grazing their cattle in an area which has been a separate conservation area. This harmonious cohabitation of man and beast makes Ngorongoro unique in Tanzania and your driver guide will be pleased to explain this incredible co-existence to you. After your morning game drive, you’ll have your picnic lunch in the crater before you return to Arusha. Your dinner and overnight will be at Arusha Center Inn Tourist. After breakfast, you’ll be transferred to the place of your departure. Rhino Explorer Tours & Safaris are looking forward to meeting you again along with your friends and family as you recommend this safari. Good luck! This safari tour will start and end in Arusha and will take you to several places in Tanzania including Serengeti National Park and Ngorongoro Crater. Please book your flight to arrive at Kilimanjaro International Airport (JRO). Transfer from and to the airport is included. Rhino Explorer Tours & Safaris will pick you up from the airport. Rhino Explorer Tours & Safaris is a passionate local expert helping adventurous safari for wildlife, nature, and cultural tour from Mt. Kilimanjaro to Zanzibar.